Historically, glass is often viewed as a remarkable translucent substance though usually made from the simplest raw materials upon the effect of firing. Nature, itself, is the best instance to learn how different temperature changes can provide various glassy states, altering from very slow rates occurring within geological time scales (e.g. obsidians – glassy volcanic rocks consisting of natural acidic silicate glasses) to extremely fast, occurring as a result of fast energetically driven collapse (e.g., by impact of meteorites, yielding melted droplets then cooled to various tektites). Mimicking evolution, however, man became responsible for the creation of further families of a wide variety of glassy and amorphous materials (geopolymers), which have gradually appeared through human creativity, particularly during last 100 years. 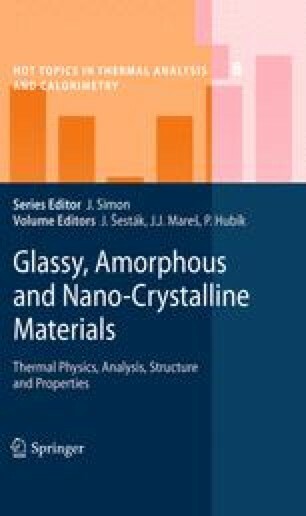 Properly chosen procedure of rapid extraction of heat (often called quenching) turned up to be a efficient route for successful glass-formation (vitrification, as a repeatable process) of almost all substances (thus allowing for the preparation of glasses from different sorts of various inorganic materials, including metals) in contrast to the traditional chemical approach, seeking just for an appropriate composition to vitrify under a customary self-cooling procedure [1,2]. The study was supported by the following scientific foundations: GAČR: P204/11/0964, MŠMT: 1M 06031 and MPO: FR-T11/335.